Thomas said the provincial government is not issuing any more licenses to fish farms. B.C. issues licenses to fish farms to set up shop on Crown land while Ottawa issues the license to grow the fish. Marine Harvest referred all questions on the on-going occupation to the B.C. Salmon Farmers Association. Jeremy Dunn, executed director of the B.C. Salmon Farmers Association, said Marine Harvest was open to dialogue with the First Nations leadership who are welcome to view their operations at any time. Striking footage of sickly farmed salmon was gathered this month by Laichwiltach Nation hereditary Chief George Quocksister Jr. and Alfred as part of a long-running campaign to push fish farms in their current form out of the region. 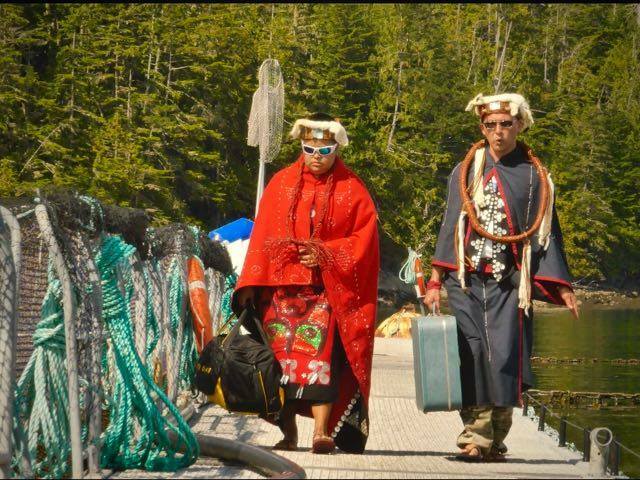 Some First Nations fear the salmon farm industry threatens to wipe out wild populations within the next decade, posing a threat to their Constitutionally-enshrined Aboriginal right to wild salmon. LeBlanc’s office deflected queries from APTN to the department. Screen grab from video shot by hereditary chiefs George Quocksister Jr. and Ernest Alfred showing salmon with swollen gills. Aided by the activist Sea Shepherd-owned Martin Sheen vessel, Quocksister Jr. and Alfred traveled to 11 farms between Campbell River and Alert Bay, gathering underwater footage of the fish. The footage, revealed emaciated and diseased salmon, some with sea lice, mingling with wild fish, including herring and rock cod. Footage from the currently occupied Swanson Island farm showed numerous salmon with what appeared to be sores, blisters and swollen gills. 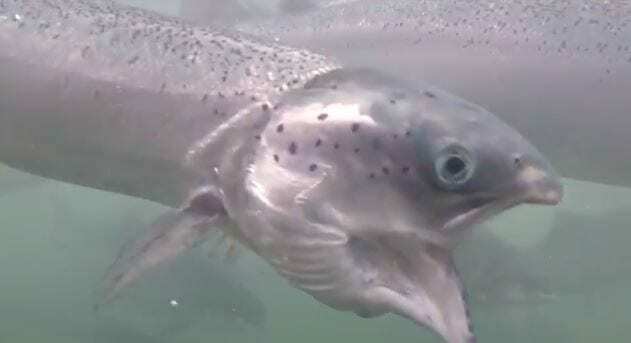 At another farm on Klaoitsis Island, owned by Grieg Seafood, footage revealed emaciated and blind salmon. Dunn said the footage distorted the reality of salmon farms. Screen grab from video shot by hereditary chiefs George Quocksister Jr. and Ernest Alfred showing salmon with tumour. Dunn said he did not know what sort of diseases may have caused the blistering, blindness and gill swelling depicted in the footage. He said only about one per cent of farmed salmon carry pathogens that pose a threat to wild populations. The federal Department of Fisheries and Oceans echoed Dunn saying the B.C. fish farm industry is tightly monitored and meets all required regulations. Screen grab from video shot by hereditary chiefs George Quocksister Jr. and Ernest Alfred showing blind and emaciated salmon. 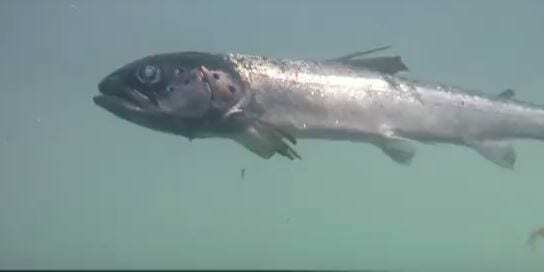 Biologist Alexandra Morton, a long-time critic of fish farming methods in B.C., said she doesn’t know what is causing the abnormalities in the salmon captured by the footage, but it may be symptoms from a previously unknown disease or diseases. Morton said she was also disturbed by the amount of fish feces in the pens holding the salmon. “You realize they are marinating in it, and that is an incredible way to spread disease,” said Morton. Dzawada’enuxw First Nation Hereditary Chief Willie Moon, who is also chief councillor for the community, led Wednesday’s Burdwood Island occupation. He said the recently captured footage surprised him despite his familiarity in battling the industry. Moon said he believes sea lice and pathogens from salmon farms are directly responsible for the decimation of wild salmon population and he worries it will be almost totally wiped out within five years. Moon said he wants LeBlanc and Justice Minister Jody Wilson-Raybould, who was once a senior chief from the province, to meet with the territory’s First Nations on the issue. “We have invited them to our community and none of them have come to our territory yet,” he said.